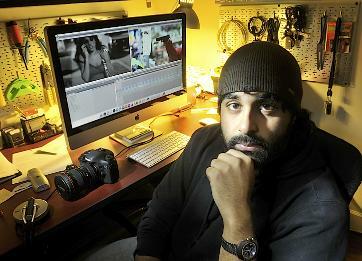 Surrey flim maker and Port Alberni son Mani Amar released his latest film – Footsteps into Gangland – last month. The movie chronicles gang life on the Lower Mailand, as well as the South Asian experience with sexual abuse and the foster care system. It is always a pleasure when one can make news in their hometown. I was elated to be contacted by Wawmeesh Hamilton of the Alberni Valley News Newspaper. Wawmeesh and I talked in-depth of the precursors surrounding the gang issue. A quick 15 minute interview became an hour long conversation. I thank Alberni Valley News and Wawmeesh for the article. A former Port Alberni resident’s new film takes a raw look at taboo subjects in South Asian culture, and if it generates controversy then people are thinking, its creator said. Footsteps into Gangland by Mani Amar chronicles a day in the lives of South Asian characters whose lives are destroyed by gangs, the foster care system and sexual abuse. The film opened in Surrey in April. The movie’s main character is Himit, who moves from a small Vancouver Island town to Vancouver where he re-connects with his now crime-boss cousin who tries to recruit him. The film’s other character is Mya, who has spent most of her life in foster care. The opening scene depicts her being raped by her foster father, then partying and using drugs as an escape. The film isn’t meant to be entertaining, nor does it sensationalize or exploit gang life. Instead, it scrapes the dark sheen of gritty subjects that need to be exposed. “I expect people to be disturbed and unnerved by what they see on screen,” Amar said. Some of Amar’s critics say that he is doing a disservice to the South Asian community and casting Sikh religion in a bad light. Others say he’s stereotyping the South Asian community. “The way things happen in my film is the way it happened in people’s real lives,” Amar said. Amar underwrote the film’s $75,000 price tag himself using “credit cards, paycheques and savings,” he said. There’s no guarantee he’ll recoup his financial investment, but the movie may pay off in ways which are even more valuable. “If this gives a girl the courage to talk about sexual abuse and seek justice,” Amar said. Amar grew up in Port Alberni but can relate to some of the film’s content because of his experiences while living on the Lower Mainland, he said. But it chillingly hits home in another way as well. “I know guys from Port Alberni who got involved in crime after moving here and their lives didn’t turn out so good,” he said. Shout out to Wawmeesh Hamilton for the support!